The holiday season is quickly approaching, and if you have spent any time in a mall or big box store you will see that the adds for Christmas are everywhere – in some cases they were up before Halloween. It’s hard to think Christmas when just yesterday I was resealing my deck while it was 89 degrees out. I have a feeling the next couple weeks will be similar, which makes the upcoming trip to the annual Autodesk University event in Vegas a welcome break from the Florida weather. For those of you that make the trek each year, I am sure you have already booked your flights and selected your classes and are anxiously awaiting the event’s beginning. I know that some of you have still not registered and some may not even know what AU is all about. For those that are new, let me tell you a little about it. Every year Autodesk puts on a huge event in Las Vegas for the past present and future users of Autodesk products. There are tons of classes, exhibits, demonstrations and parties to keep you busy. Attendees can learn not only about Autodesk products, but even more from vendors and sponsors that are also at the event. Additionally, this is a great place to learn about current and future industry trends and what some of your peers are doing. It is a great event to learn, share, and network. 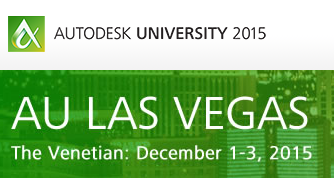 To get more information and get registered, head over to the AU 2015 website http://au.autodesk.com/las-vegas/overview and get signed up.